My discussion topic on the walkhighlands.co.uk forum has been converted in to a reader’s poll where you can vote for the three best pubs for walkers in the Highlands. Two of the nominations are mine, one extremely obvious the second probably unknown to many. 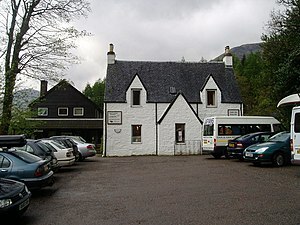 This had to be nominated as the iconic climber’s and walker’s pub nestled in the heart of Glencoe. With The Three Sisters, the Aonach Eagach Ridge, Bidean nam Bian just a stones throw away most people when they have been out on the hills close by gravitate here in the evening. Good food (try the Venison Sausages), local beer from the Atlas Brewery and plenty of tall tales from the mountains. Just before the A828 cross Loch Creran on the way to Oban this pub used to have a pretty poor reputation. New owners and a major refurbishment have transformed it in to a great place for a drink and good food. The picture windows facing westwards out on to the give fantastic sunset views and if it is warm enough you can sit outside on the terrace decking. This is a good place to visit if you are tackling some of the Munros or Corbetts from Loch Creran such as Beinn Sgulaird and Creach Bheinn. Not surprisingly the ever popular Clachaig Inn is the frontrunner at the moment. You can register your vote here, but you will need to register as a forum member if you are not already. Over at the excellent walkhighlands.co.uk forum I have launched a quest to find the best walker’s pub in the Highlands. You know the sort of place, somewhere you long to be when you’re on a hillside with a gale force wind and a blizzard battering you. The thought of that blazing log fire and plate of steaming sausage and mash keeps you going. Or on those glorious days when the sky is blue and the sun cream is out you know that your thirst can be quenched by a cold pint down in the inn in the valley so it spurs you on to yet another peak. I have asked fellow forum members to come up with their nominations for their favourite walkers pub. If you haven’t already visit the site and nominate your favourite. If it’s your visit take a look around and see what else is being discussed as well.